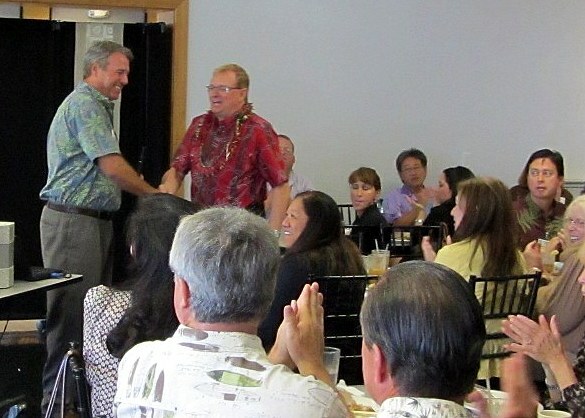 Chuck Erskine (left), vice president of Hawai‘i Island Chamber of Commerce and chair of the Economic Development Committee introduced Chancellor Straney. 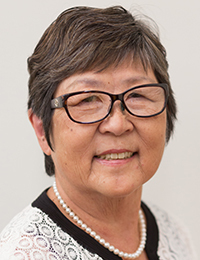 Mr. Erskine is assistant vice president and area manager for the Waimea Branch of First Hawaiian Bank. University of Hawai‘i at Hilo Chancellor Donald Straney gave a presentation today to local business leaders on UH Hilo’s impact on the economic life of Hawai‘i island. 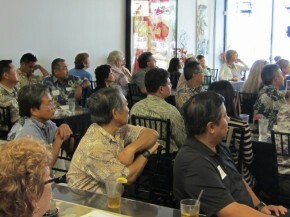 The luncheon event, held at Restaurant Encore in Hilo, was sponsored by the Economic Development Committees of the Hawai‘i Island Chamber of Commerce and the Japanese Chamber of Commerce and Industry of Hawai‘i. Local business leaders listen to Chancellor Straney’s presentation. Chancellor Straney’s talk, entitled, “Toward a Vibrant Economy for 21st Century Hawaii,” focused on UH Hilo’s role in the Hawai‘i island economy as a thriving enterprise creating thousands of jobs, generating millions in revenues, and developing educational and outreach programs in answer to island and state needs.